I woke up about four o’clock this morning to the sound of steady rain and the chants that accompany Pchum Ben, also known as Ancestor’s Day — one of Cambodia’s major Buddhist holidays that lasts fifteen days. Cambodian Buddhists believe that those who died with bad karma are not reincarnated at death but instead are trapped in the spirit world. At Pchum Ben these trapped souls are released to find their living relatives and to repent. 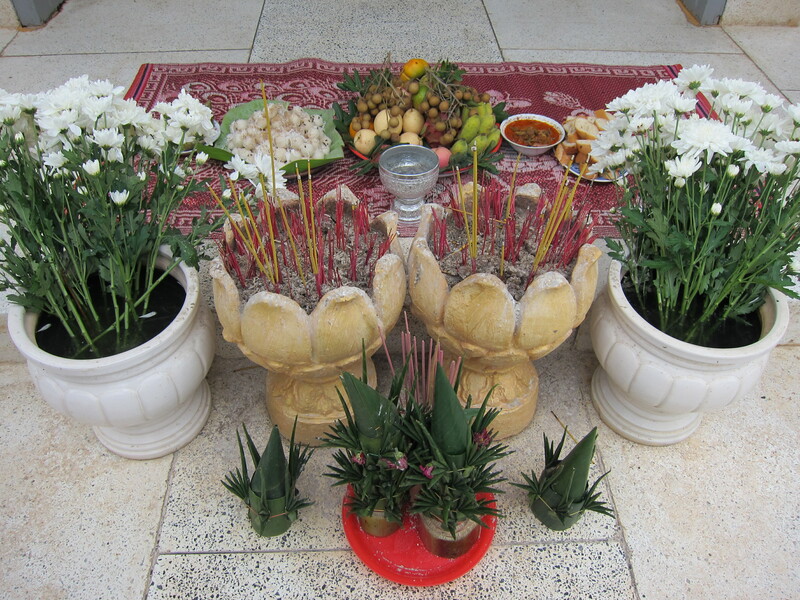 During this festival, Cambodian’s visit pagodas and pray for the souls of their dead relatives. And because they believe that those trapped in the spirit world are hungry ghosts that are tormented by voracious appetites and pinhole mouths, they also offer food for the souls of any unfortunate ancestors trapped in this spirit world. Some believe that the food they offer to monks is somehow transferred to their ancestors, thereby satisfying their tormenting hunger. Others believe in a more direct approach and will throw sticky rice into fields in hopes of satisfying the hunger of these tormented souls. In the midst of Pchum Ben, we conducted the first day of our Vacation Bible School for the kids at the Imparting Smiles orphanage and kids from the surrounding area. Of course, it continued to rain on and off throughout the day. However, the rain did little to dampen attendance or enthusiasm. Rain-soaked kids came in their muddy bare feet and a few toddlers arrived wearing nothing but a smile. No one seemed to notice or care about the random bare bottoms swaying to the music. The kids were dialed in to the Bible stories and crafts and music and recreation. We offered one session in the morning and a second session in the afternoon. Kids continued to arrive throughout the afternoon as word spread throughout the community. We expect even more kids on our second day. Our ladies are doing a fantastic job. A few months ago I asked Kara Potts to serve as our point person for this initiative. 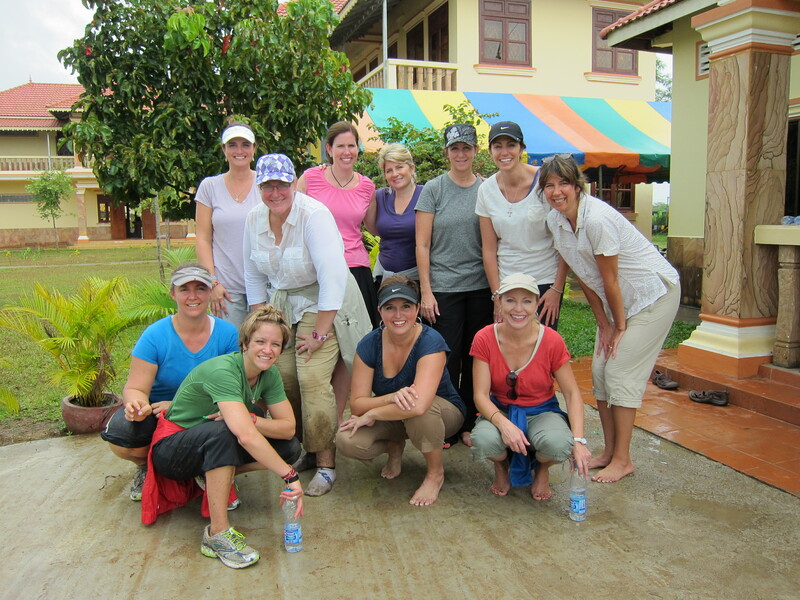 She and our ladies met several times to plan lessons and organize crafts and other activities. And although the rain has made things more interesting because most of our activities are outdoors, our team has proved to be more than flexible. They are as fluid as the rain. From walking in bare feet through muddy paths to invite local children to teaching under awnings to hugging kids soaked from head to toe, our ladies have demonstrated the love of Jesus. No one has uttered a single complaint and everyone has done whatever it takes to make things happen. I have been amused by the fact that although our gals are sliding around in their bare feet, are caked with more than a little mud, and have slipped a time or two, they are still ladies. Every now and then I will see one of them refreshing their lip gloss. The best thing about our ladies is how they love these kids without condition. I have seen so many tender moments throughout the day that remind me that our ladies are the hands and feet of Jesus to the poor children of Poipet. The hugs and kisses, the patience in helping a child with a craft, the laughter at recreation, the joy in our music class all combine to help these kids understand that they are loved. One little boy in particular has captured our hearts. He is the new kid at the orphanage. His mother died of AIDS at a local clinic and entrusted the clinic to find a home for her son and his older sister. The folks at the clinic brought the kids to the Imparting Smiles orphanage. These kids speak a mixture of Khmei and Thai and are a little hard to understand, but the staff at Imparting Smiles has embraced them and is committed to loving and caring for them. We are privileged to be here to lend a hand and a hug to help affirm the worth of these kids who otherwise would have little or no hope of a future. These stories sound wonderful & I am so proud of my dear friends–plz tell my girls I love them & I’m praying for them. Has Vicki found my Hope yet? Thank u for updating us–I get so excited when there is a new post–love y’all!! Keep on keeping on!! Thanks, Kristin. I will pass on your regards to the girls and ask Vicki about Hope. 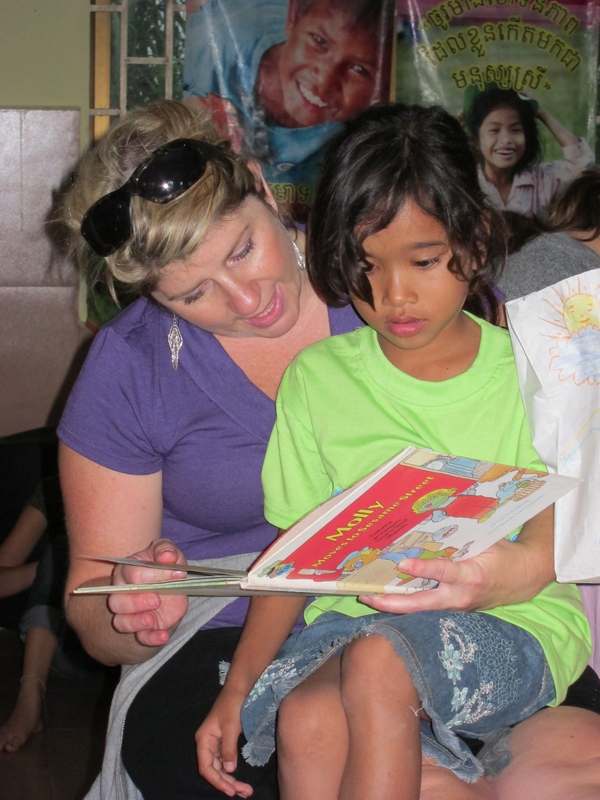 How I wish I were there to love on those children and serve with my friends! This post almost makes me feel like I am there so thank you! Thanks, Amy. You would absolutely love it here. Lots of kids just like at Pastor Rudra’s slum school in Kolkata. How exciting to read your stories and know you are half a world away serving Jesus and the people of Cambodia as our team did in El Salvador! These people we meet and embrace are indeed poor in spirit, but you are bringing Jesus to them – for God is present in the company of the righteous (Psalm 14:5). This is my prayer for the mission teams out this week. May God continue to bless you to bring blessings! Thanks, Jill. Welcome back from El Salvador. Thank you and the rest of our water well drilling team for your good work. What a wonderful story! Such a great team you have serving with you! Still praying for the time my schedule will open up and I will accompany one of the teams on a journey such as this. Love hearing the stories of the blessings taking place there. Continued prayers for you and your team! Thank you, Valerie. Would love to have you on a future team. Thanks for your prayers. How exciting to read all your posts and hear of all the Lord is doing on the trip. Praying for you all! Thanks, Wendy. Thanks also for your prayers.